Above the treeline, Thredbo is truly stunning. To the uninformed, the fact that Australia has ski resorts might come as a surprise. But many Australians, particularly those in Canberra, Sydney, and Melbourne make the pilgrimage to the Snowy Mountains every year (the clue is in the name!) to seek out their snow-related fun. Thredbo, Perisher, Falls Creek, and Mount Buller are some of the more well known resorts, but there are a bunch more. Now you know. Thredbo is one of the larger resorts, close to Perisher. Opened in 1957, it’s also one of the oldest resorts in Australia, and the highest at 2,037m (6,680ft) at the top. Modeled on a European ski resort, it’s a nice place to be, though a little jarring knowing you’re half a world away. And, it’s one of few resorts to actually open as a bike park during the summer season. Falls Creek and Mount Buller both have bike park trails, however they utilize shuttle vehicles. 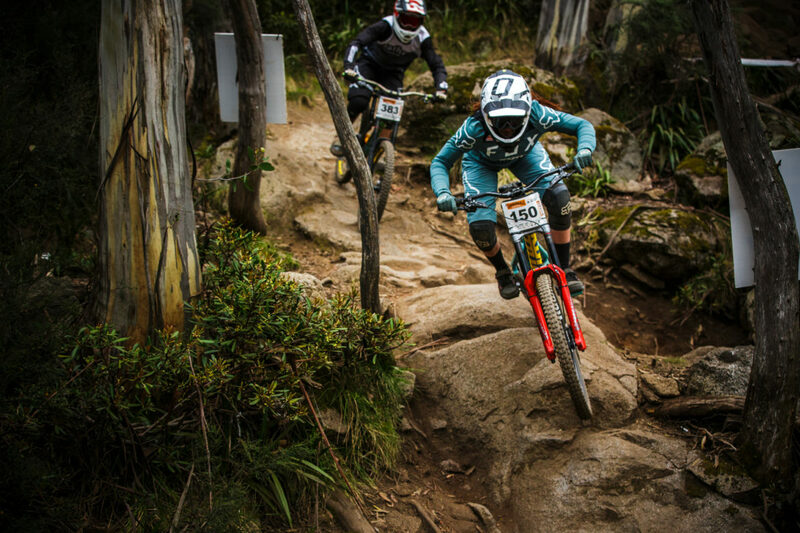 Thredbo is the only bike park in Australia to run a lift in the summer for mountain biking. Thredbo is a beautiful place and the drive up to the resort is stunning. Set in the rolling alpine scenery of Kosciuszco National Park, the mountains steadily climb up, rather than abruptly appearing out of nowhere. Covered in snow gums, with their stark white trunks and sometimes dead-looking branches, it almost looks like the mountains are covered in ghostly forests. You’d be forgiven for thinking you were somewhere other than Australia, but then these mountains look like nowhere else on earth. They’re breathtaking. Before you know it, you’re 1300m high up in the Thredbo resort town, and you can feel the coolness in the air that the altitude brings with it. 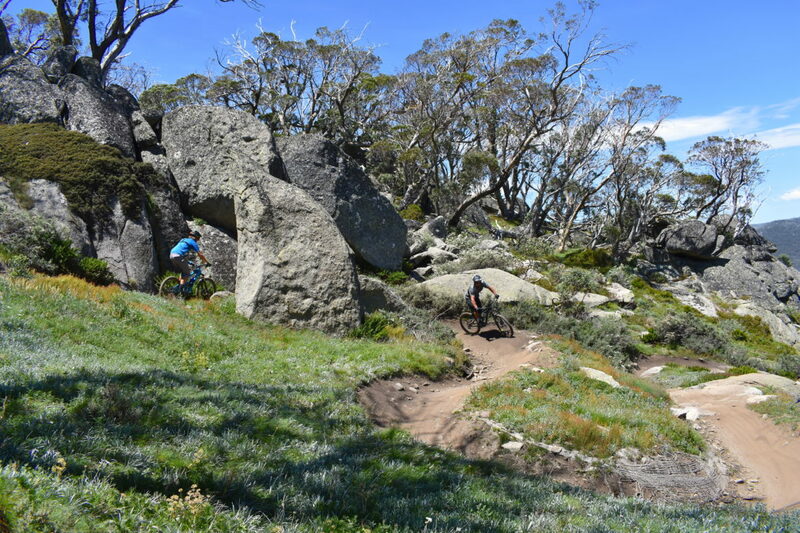 A mix of scattered snow gums and giant boulders give the trails some great features. Thredbo currently has four gravity trails serviced by two lifts. The Kosciuszco Express is the main lift open all season, 9:30am – 4pm. Some trails can also be accessed by the Gunbarrel Express, which is open on weekends through the the height of summer (Christmas to the end of January). Gaining 560m in height on the main lift, this means that the trails here are pretty long! Easy Street is a new green trail that opened this year, running from the top of Gunbarrel Express. It traverses the higher parts of the hill, with some relatively mellow singletrack, fun berms, and small jumps. Advanced riders can enjoy this trail too, as it’s easy to pick up speed. Easy Street then joins onto the blue Flow Trail to the bottom of the hill. This doesn’t seem to make a whole lot of sense, as there is no green option top to bottom; green riders simply get funneled onto the more advanced blue trail. The Flow Trail has some fun optional lines if you know where to look. 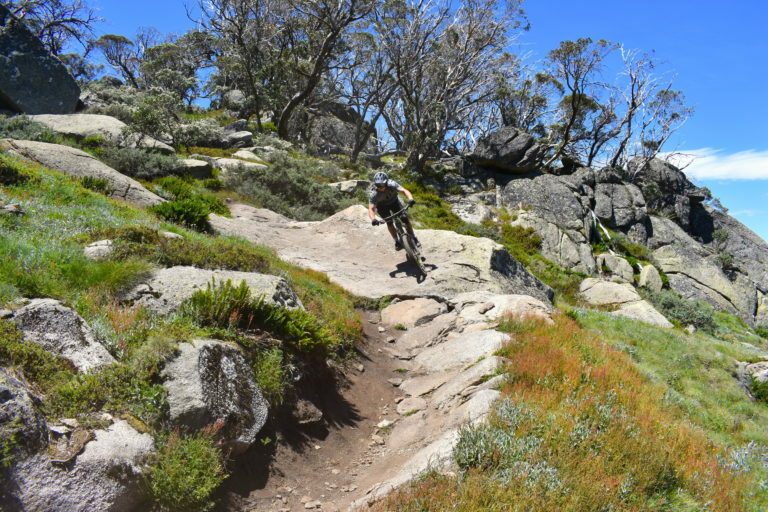 Kosciuszco Flow Trail is Thredbo’s intermediate blue-graded trail. Starting from the top of the Kosciuszco Express lift, the Flow Trail takes riders all the way to the bottom of the mountain. At about 6.5km long, it takes approximately 10 minutes for a fast rider to complete. The Flow Trail has been around for years, but new for the last couple of seasons is a singletrack top section which cuts out a steep, sketchy fire road descent (though you can still ride this if you want), giving riders a few extra minutes of singletrack for the price of a short, easy climb. Kosciuszco is a really fun trail to ride, though it’s definitely not for beginner riders. The trail starts with some small rock gardens and rocky sections of trail before shooting riders into high speed corners through the trees. The landscape here is crazy, crossing ski pistes into strange Australian alpine forest and back over more high-speed ski piste. The trails here get pretty dusty and loose, but it’s high speed most of the way down, with fun jumps and drops, some of which you can go really big off! It’s a roller coaster all the way down and it’s so long that the trail doesn’t get old too quickly, though the ride down can be a little rough on the arms. The Flow Trail tends to get quite busy in peak season and weekends, with lots of beginner riders and families. This is where Thredbo could use a green trail top to bottom. The Flow Trail is fast and fun! Built for the 2016/17 season is the All-Mountain trail. Starting with the same singletrack as the Flow Trail, the All-Mountain trail is altogether more technical, and a lot longer at 10km long. This trail is a real treat, taking riders away from the main runs a little and offering more of an alpine singletrack experience. Riders do have to work a little more for this trail, but it’s so worth it. The top section of the All-Mountain trail starts off technical and rocky; it can be hard to find your flow here, though speed isn’t necessarily the key. The trail comes past the top of the Gunbarrel Express lift, making it possible to ride laps of this trail. As the trail drops lower below the tree line, the trail changes from fast and open to tighter, more technical singletrack, weaving between trees and rocks and undulating into steeper sections with a couple of short pinch climbs. This trail really keeps riders on their toes the whole way down. Cannonball Downhill is perhaps one of the most famous downhill tracks in the country, and the location for many a race over two decades of riding. That said, the Cannonball Downhill run is only for serious riders. It’s a graded black trail, and full-face helmets are compulsory on this one. The start of Cannonball Downhill is accessed from the fire road below the Kosciuszco Express lift. This trail is packed with technical features, including big rock gardens, steep chutes, jumps, and a wooden wall ride. It’s a real test of skill, and a lot of fun to ride. 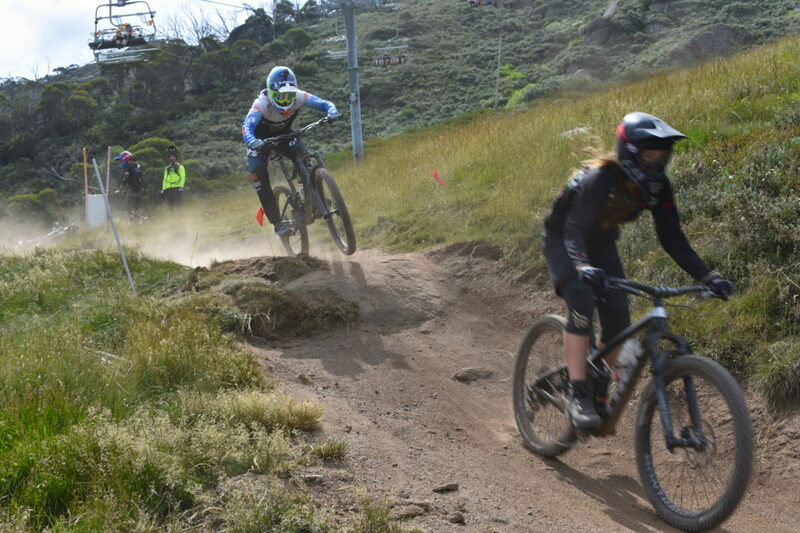 More raw than the other trails at Thredbo, the Cannonball Downhill has barely changed in years. But hey, why fix what isn’t broken? Many Australians will be familiar with this track just from race run videos, and that in itself is a cool reason to come here and ride this trail. The very end section of the Cannonball Downhill drops into their recently renovated Valley Terminal Jumps Zone, with a bunch of big table top jumps and some step downs with good progression. These jumps are pretty fun and nicely sculpted with some fairly committing lines! 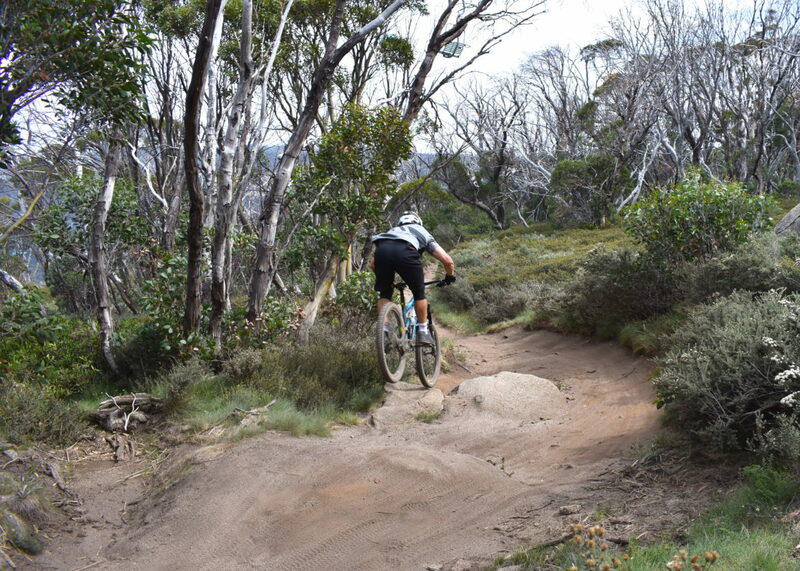 Thredbo also has a couple of cross-country trails including the Village Loop, Friday Flat Loop, Pipeline Path, and the Golf Course Loop. These trails are all fairly short, at around 2km each, so they’re more of an additional activity, perhaps something to have fun on in the evening if you’re staying up the mountain. The Pipeline Path is graded beginner and is essentially a family loop, good for kids or beginning riders. Golf Course loop is graded intermediate and is a short but fun trail with a few small technical features, while the others are graded beginner/intermediate trails, each a fun addition to the gravity trails. 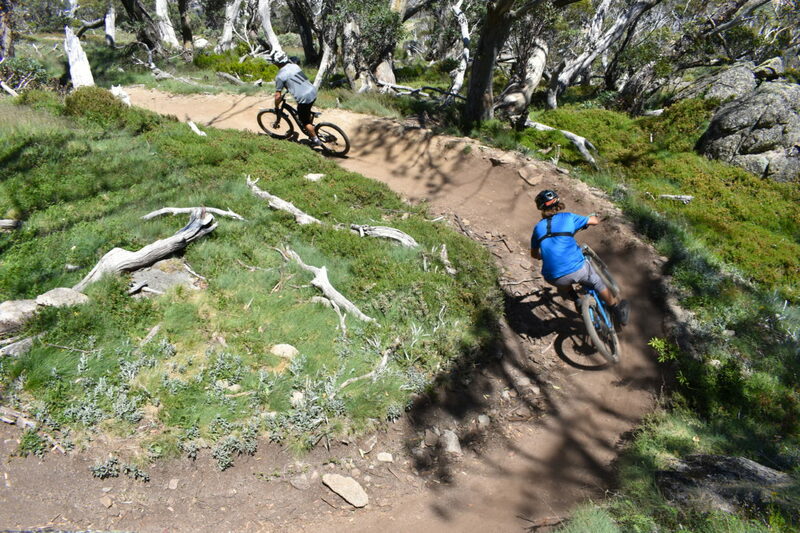 The Thredbo Valley track is a dual-use path that’s a very easy ride, but gently descends for 20km from Thredbo resort, all the way down to Lake Crackenback. Though it’s not technical, it’s a beautiful ride, following the Thredbo River all the way down, through eucalyptus forest and with amazing views. It’s not a bad way to end the day; one designated driver could pick everyone else up at the bottom on the way down the mountain. 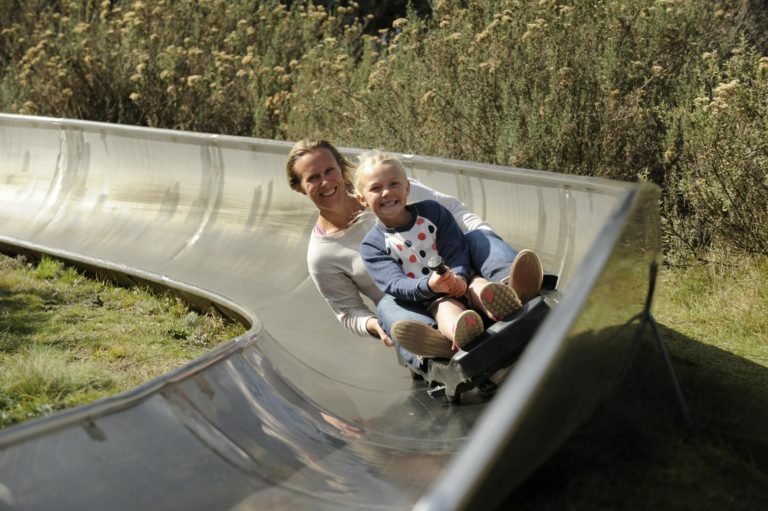 Thredbo has a host of other activities to keep the whole family happy. As it’s only a couple of hours from Canberra, Thredbo is a very touristy destination. Some of the activities on offer include golf, bobsled/luge, disc golf with discs for hire from the ticket office, fly fishing, and more. The top of the mountain has a network of hiking trails, including one to the summit of Mt. Kosciuszco. If you’re around for a few days then it’s well worth doing, as the views are incredible from here. At 2,228m this is the summit of highest mountain in Australia. Thredbo also has a leisure center with a gym and tennis and squash courts. Thredbo is one of those places that always seems to have something going on, and that’s probably why it’s so busy, even through summer and the shoulder seasons. The biggest event on the MTB calendar is the legendary Cannonball Festival. Held annually at the start of December, the Cannonball Festival is four days long and celebrates mountain biking with races, BBQs, and parties. With five event categories for everyone to enter including a whip-off event, a flow-track race, and the open DH, it attracts all sorts of riders including a host of pros like Kyle Strait, Troy Brosnan, Tracey Hannah, Yoann Barelli, and Loris Vergier. There are other races and festivals such as The Snowies MTB Festival, the Rocky Trail NSW State Series, Girls Retreat, and frequent skills master classes. 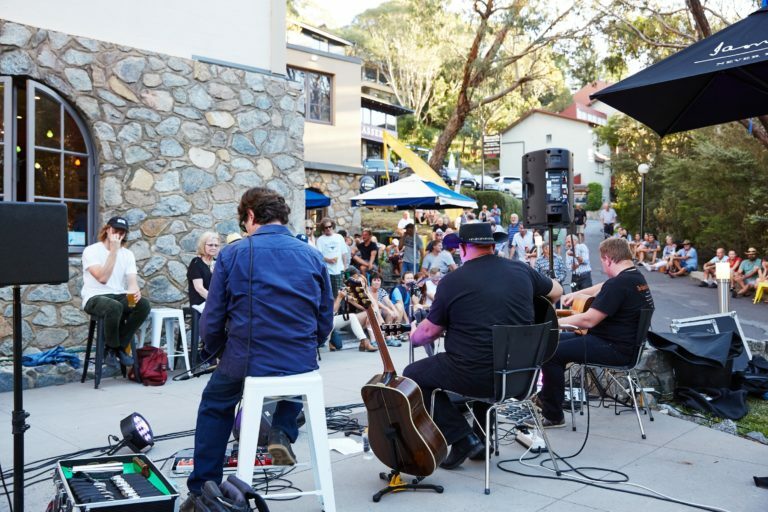 Thredbo also hosts plenty of non-bike related events, including a craft beer festival, special events for Australia Day, Valentines Day, and Mothers Day plus various food, drink, and music festivals. Find their events list here. A lift ticket for the day costs $77AUD plus $5 for a card for adults; $55 plus a card for riders under 18. There are discounts for buying online before you arrive. You can re-use the card so subsequent days are cheaper. They also offer packages for family lift passes, accommodation, and lift packages so there are plenty of ways to save some money. Check out lift pass pricing here. Thredbo rental shop has a good fleet of Norco bikes (at the time of writing), including downhill and all-mountain options. Most of the trails are rideable and sometimes even preferable on an all-mountain bike. Pricing starts at $148AUD per day for adults and $124 for children. Guests are spoiled for choice when it comes to on-mountain dining. There are over 30 establishments on the mountain serving a range of food and drink at all different price points across different types of food, from casual cafes to high-class dining. The Avalanche Cafe is right at the bottom of the lift and serves food and drinks all day, including great barista coffee, burgers, and fresh sandwiches. The Local Pub is open 365 days a year and serves good beers, including locally-named Kosciuszco Pale Ale, and classic pub food. Check out this page for a list of all the food and drink establishments up the mountain. 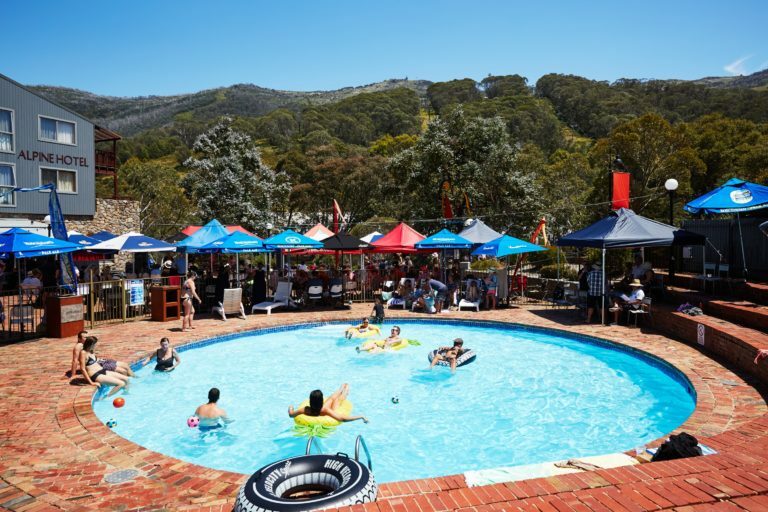 As Thredbo is a ski resort, there are multiple options for accommodation on the mountain, including studio cabins right on the river, luxury hotel rooms, and self-catered apartments for larger groups. From around $150 per night for the smaller cabins and upwards for the bigger places, there’s no shortage of accommodation during the summer. Check out the on-mountain accommodation here. If you want cheaper accommodation, Jindabyne is the main town at the bottom of the mountain and has supermarkets, shops, bars, and a whole load of Airbnbs. There are also a few free campsites in the area including a couple inside the National Park on the main road to Thredbo called The Diggings and Ngarigo Campground. Expect to find lots of fast corners like this one! 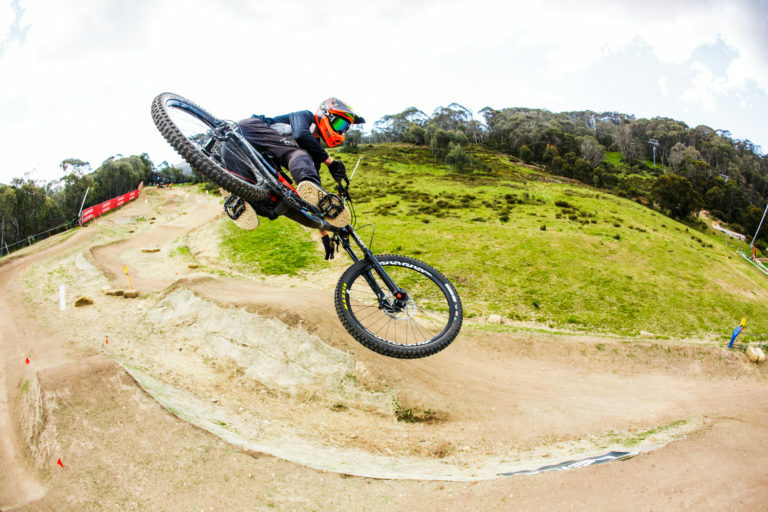 If you’re heading to Thredbo, plan to spend a day or two riding. (I found a day was plenty.) However, there are many other mountain bike trails in the area. Several cross-country trails can be found in and around Jindabyne itself, and there are some short loops in nearby Crackenback and Bungarra. For bigger rides, Canberra has a few different riding destinations, the biggest of which is Mt Stromlo (look for an in-depth report coming soon), and a few smaller ones such as Majura Pines, Sparrow Hill, Isaac’s Ridge, and Tuggeranong. You could also tie Thredbo into a much bigger road trip, especially if you’re coming from Melbourne. Along the Hume Highway (M31) there are a few different points where you can head off into the mountains to sample destinations such as Falls Creek and Mount Buller bike parks. 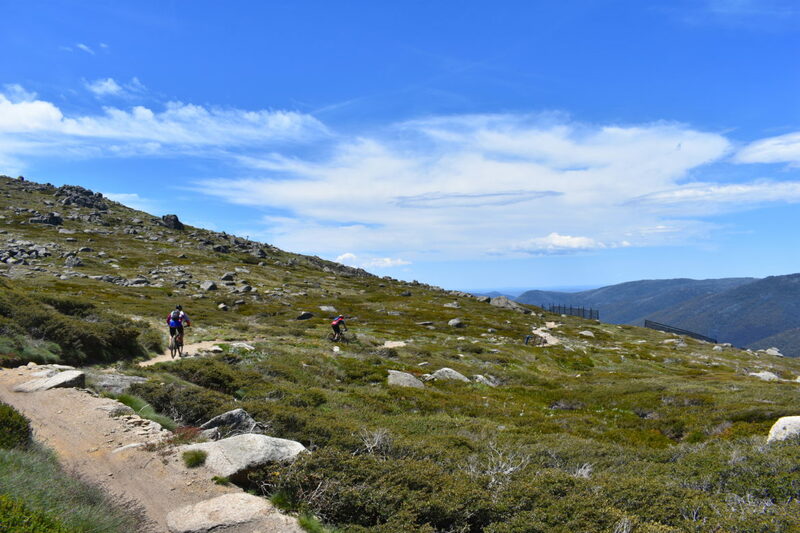 Near Falls Creek is also Mount Beauty which has one of the oldest trail networks in the country, and one of the most fun. Thredbo is about half an hour up the Alpine Way from the main service town of Jindabyne. From major cities, Jindabyne is roughly two hours south of Canberra, 5 hours south of Sydney, and about 7 hours north of Melbourne by car. Public transport for Jindabyne is poor. There is a bus, but good luck getting your bike on there. The best idea would be to hire a car/van if you’re coming from overseas, potentially flying in to Canberra or Sydney. It’s worth noting that there is a roughly $20 per car toll to enter the National Park when you drive up to Thredbo from Jindabyne.